Culture Minister Regev slams left for protesting Nationality Law instead of focusing on bigger issues. 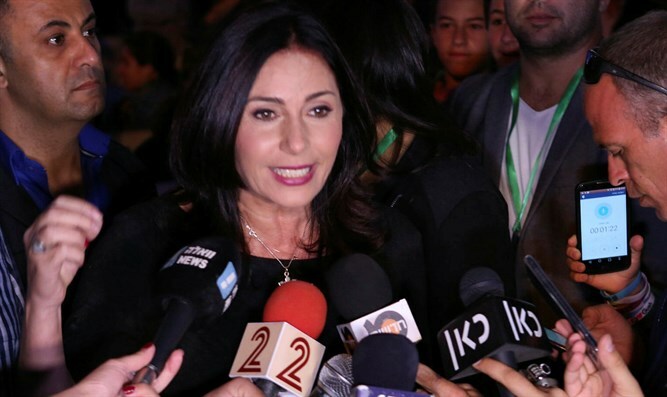 Culture and Sport Minister Miri Regev (Likud) on Saturday night slammed the leftist protest against the Nationality Law. The protest, held at Tel Aviv's Rabin Square, included thousands of people and aimed to show how the new law - which focuses solely on defining the state's character, and does not infringe on citizens' rights - "harms" the Druze community. "While kites burn in the air and incendiary balloons continue endangering the lives of southern residents [Labor leader] Avi Gabbay and the leftist camp continue busying themselves with petty politics, trying to spark a fire between the Druze community and the Israeli government," Regev said, promising that, "Gabbay and his leftist friends will not succeed." Public Security Minister Gilad Erdan (Likud) also slammed the Tel Aviv demonstration, pointing out that politicians and others with a vested interest in fanning the flames were participants. In an interview with Hadashot Sof Hashavua, Erdan expressed support for the Nationality Law, emphasizing that it complements existing Basic Laws and noted that Israeli Prime Minister Binyamin Netanyahu's staff will provide a response to the Druze complaints.